A deep antique brown with a vine full of flowers -- what could be more earthy? Each cuff is made individually, so yours will present its own unique character in this handsome design! I've removed these from inventory twice, and twice they've been brought back due to continuing requests. Thank you for your appreciation! For other color variations of this design, search the term "floral vine" in my shop. Small, which will fit a wrist measuring 6" - 6 1/2" (15.24cm - 16.51cm). Medium, which will fit a wrist measuring 6 1/2" - 7" (16.51cm - 17.78cm). Large, which will fit a wrist measuring 7" - 7 1/2" (17.78 - 19.05cm). It can be made in other sizes on request. Just put your size preference in the Notes to Seller or write to me after placing your order. Listing is for one band. Made with a superior grade of 8/9 oz full-grain vegetable-tanned cowhide and finished with protective products. This bracelet is beautiful! It arrived timely and in pristine condition, including a thank you message and how to take care of the leather cuff bracelet. I would highly recommend this artist to others. I really love this bracelet, but it's too big. I ordered a small and I can still fit 3 fingers inside it. Planned on wearing it for my wedding, so I'll see if I can find someone who could possibly make it smaller. But it's very pretty and awesome quality. I recommend Paypal for your online purchase security and convenience. You can select this option in the beginning of your check-out process. *No Paypal account? Please note that Paypal now allows payment without an account; just follow the simple directions in the checkout process*. Orders paid for by E-Check will be shipped once your e-check has cleared. You can also pay with your credit card or Etsy Gift Card via Etsy's Direct Check-out. BELTS - **READ CAREFULLY!! - *Please make sure you check your size. Do not rely on the number on your old belt or on a well-worn pair of jeans: these things stretch over time! Getting a correct measurement is the Buyers responsibility - Please don't guess!! If you need help, I am glad to assist. A MEASUREMENT OF YOUR WRIST IN INCHES OR CENTIMETERS IS THE MOST USEFUL NUMBER TO SEND ME TO ASSIST YOU IN DETERMINING SIZE. My wristbands are sized according to wrist measurements. I add the necessary length to this wrist measurement to allow for bending around the wrist and overlapping/snapping. If you don't have a cloth tape-measure, you can fashion a measuring device with a strip of paper - wrap it around your wrist and then measure the result against a ruler. Because people have different preferences on how a band should fit, most of my bands are listed with a sizing range between 2 numbers. This indicates that it will fit loosely on a wrist in line with the smaller number, snugly on the larger wrist. For example, if a size reads "will fit a wrist measuring 6" - 6 1/2" " then it will be loose (not sloppy) on a 6" wrist and snug on a 6 1/2" wrist. Keep this in mind when ordering. As an example, a size small is made for a wrist measuring 6" - 6-1/2" (15.2cm - 16.5). . 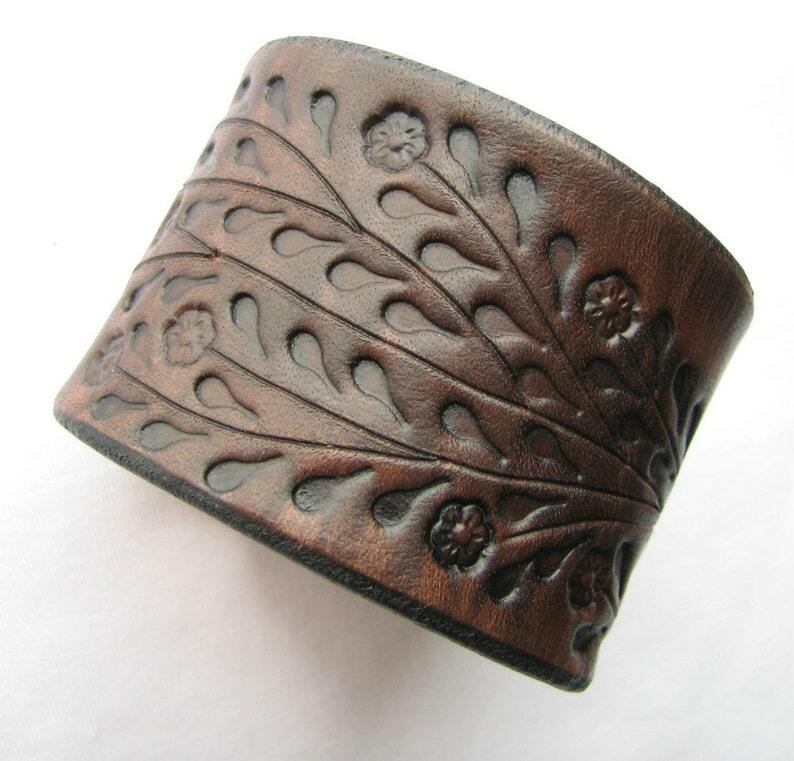 The overall length of the cuff is about 8-1/4" (21cm) , the distance between snap centers is about 7-1/4" (18.4cm). About 3/4" (1.9cm) is "eaten up" by the thickness of the leather and the physics of circumference, so this gives an interior measurement of about 6-1/2" (16.5cm) , resulting in a snug (not tight) fit for a 6-1/2" (16.5) wrist and a more relaxed fit for a 6" (15.2cm) wrist. A medium is 1/2" (1.3cm) larger on all the above measurements, a large is 1/2" (1.3cm) larger than a medium. This info applies to cuffs & wristbands with the heavy-duty snaps. The 1/2" wide bracelets (characterized by a lightweight snap) are sized differently, to fit like a bangle. If you'd like specifics on those, feel free to write me with your questions! If you are requesting custom sizing and you're using a favorite band as a size guide, please measure the distance between snap centers (not end to end) and let me know that you are sending a "band" measurement, not a wrist measurement. It is also helpful for me to know if the band you are measuring is of a substantially different material than the full-grain cowhide I typically use. Variations in thickness will affect the sizing. Each dye lot is unique and each piece of leather will "take" the dye in its own way. For that reason, the colors you see in the listings may vary somewhat from the item shipped. If a specific shade or tone is important to you, please let me know and I will do my best to accommodate your request. I am very careful with my packaging -- your goods will arrive in good condition; if they do not, please let me know!! All domestic mailings will be shipped with delivery confirmation numbers. At the end of January, 2013 the United States Postal System raised rates, resulting in a doubling (or more) of international shipping rates. I apologize for the charges, which I feel are excessive but out of my control. The one bit of sunshine I can offer you - It is my policy to ship for just one fee, so the more you order at once, the better these new rates work out for you. International Shipments: Shipping & Handling charges do not include brokerage fees, import duties, VAT or tariffs; these are the responsibility of the customer and are usually collected upon delivery. If you are not familiar with your country's policies regarding international purchases, this information is available through your local Post Office. 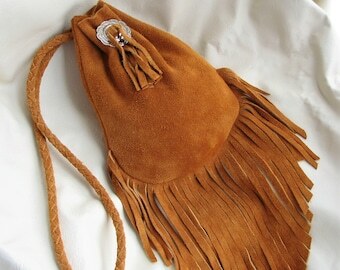 These goods are made with leather and will sometimes display scars, stretch marks, brands and other "range markings". These are your proof that this is a natural product and, as such, should be considered as part of the character of the item and NOT a defect. I am pretty fussy about such things and am always careful to position these markings in a way that will not detract from any design. If such scars or markings would present a weakening of the leather, I will not include them in any item. I am currently not accepting any custom orders..